Often, when you haven’t been to the dentist for some time we will recommend a pair of dental x-rays, referred to as bitewings. These x-rays show both the top and bottom teeth in one film. The benefit of these x-rays is to help us diagnose any underlying problems which can’t be seen by the naked eye. These include periodontal (gum) disease, the location of impacted and unerupted teeth, and also the area in-between the teeth which we need to locate cavities and other signs of disease. Without taking dental x-rays the dentists can’t be sure that everything has been discovered. If you have a history of a high rate of decay, we may recommend taking the bitewings more frequently so as to prevent any further complications. Generally, we recommend the x-rays be taken every 2 years. These dental x-rays can simply be taken in the chair during your regular check-up. Sometimes the dentists may also ask for a special type of x-ray called an OPG. This type of x-ray needs to be taken at a special radiology center and is all covered by Medicare. 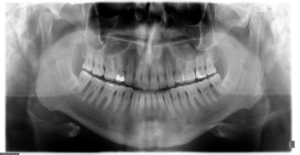 An OPG shows us the whole jaw and mouth, and is commonly used to view wisdom teeth and monitor bone levels. The radiation dose of modern dental X-rays is very low; one dental X-ray is equivalent to spending a day in the sun or going on a plane flight from Melbourne to Sydney. For comparison, 1 chest X-ray has the same radiation dose as 20 dental X-rays! The accessibility and discovery of taking x-rays have made diagnosing diseases far more reliable and efficient. If you have any questions about this amazingly helpful tool, please do not hesitate to ask our friendly staff! If you have any questions about your dental health, feel free to Contacts Us and ask our friendly dental team! Dental decay – What it is and how to prevent it! Should I get Fissure Sealants for my child?